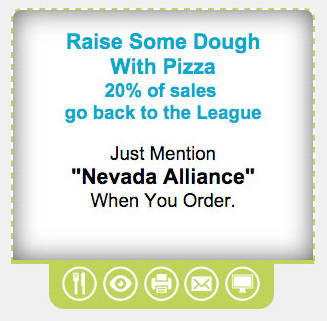 Nevada Alliance has some great opportunities to help support youth soccer in Las Vegas. By advertising your business with Alliance you will be able to reach a large captive audience and target your message for better results. For more information about these great options click on the buttons below and become a partner with Alliance TODAY! ► .jpg or .png file format. Animated gif excepted. ► Artwork must be 570px X 100px (72 dpi/RGB) with a max size of 35k. ► The URL you want the ad to link to. ► Artwork must be 300px X 250px (72 dpi/RGB) with a max size of 35k. Note: These ads are not exclusive to one advertiser. All ads will appear randomly on refresh of the page. Ad is placed at bottom of the screen window on home page only. Will stay visible until user changes the page or closes the ad. Ad size wil vary depending on device. Format: .jpg or .png file format. Just a few reasons why you should sign up Today. ► You can advertise promos or offers. ► Semi-exclusive ad space for the season. Shared only with League Sponsor. ► Ads are text only. No images allowed. ► You can link to your website or other landing pages. 750+ email sent per season. Tell every parent that registers their child with Alliance about your business. ► Included in at least 4 league emails. ► Logo with link in sponsors section of all promotional emails. ► Included in one sponsors email. 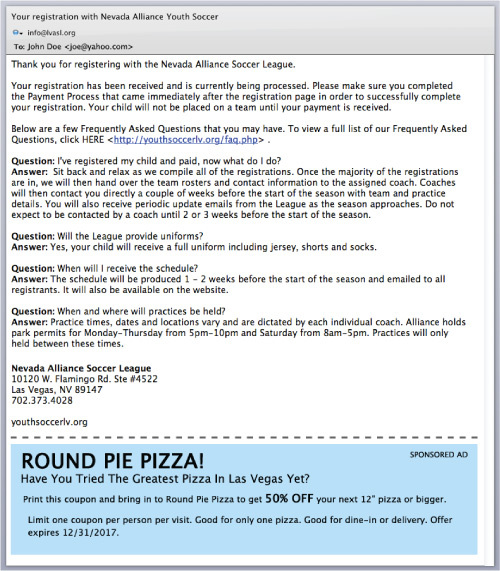 We send regular emails to our subscribers with league announcements and offers from our sponsors. ► A coupon or special offer on our "Sponsors Offers" page. ► 1 emails sent to over 8,500+ parents, coaches and more. ► Logo listed on the "Support Our Sponsors" section on the home page. ► 2 posts on our Facebook Fan Page and Twitter page. ► Your logo at least 300x250px (72 dpi or larger). ► A coupon or offer no bigger than 8.5" x 11". Note: This package includes both desktop and mobile versions of website. Logo listed on the home page is a non-linking image. 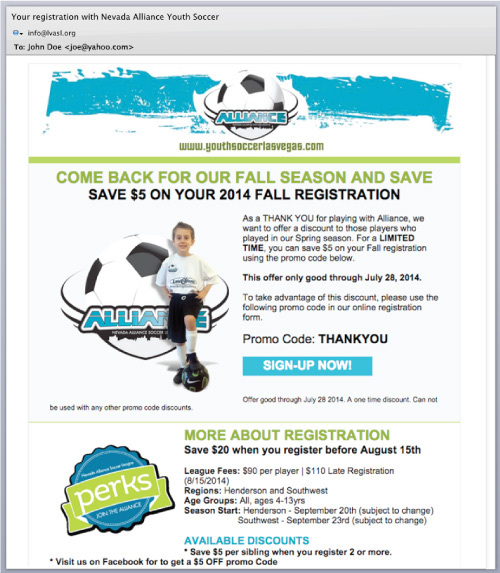 ► 2 emails sent to over 8,500+ parents, coaches and more. 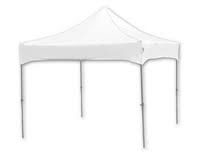 ► Offer placed at top of home page as a featured sponsor. ► Your offer formatted to 300x250px (72 dpi or larger). Note: This package includes both desktop and mobile versions of website. Logo listed on the home page is a non-linking image. Advertisment on home page may rotate with other offers. 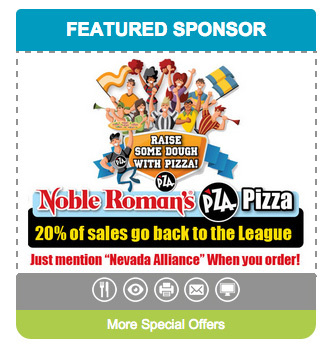 Becoming a League Sponsor is the ultimate way to show your support to a non-profit organization rooted in creating a positive outlet for the next generation. Not only does organized athletics teach our youth structure and commitment, it also helps to encourage an active lifestyle. 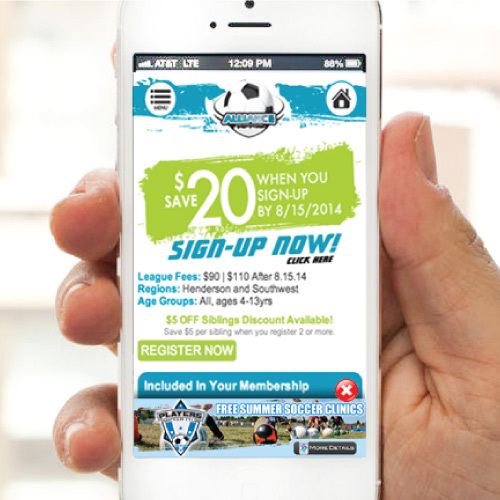 Show your support by becoming the official League Sponsor. ► Logo in footer of all emails sent. 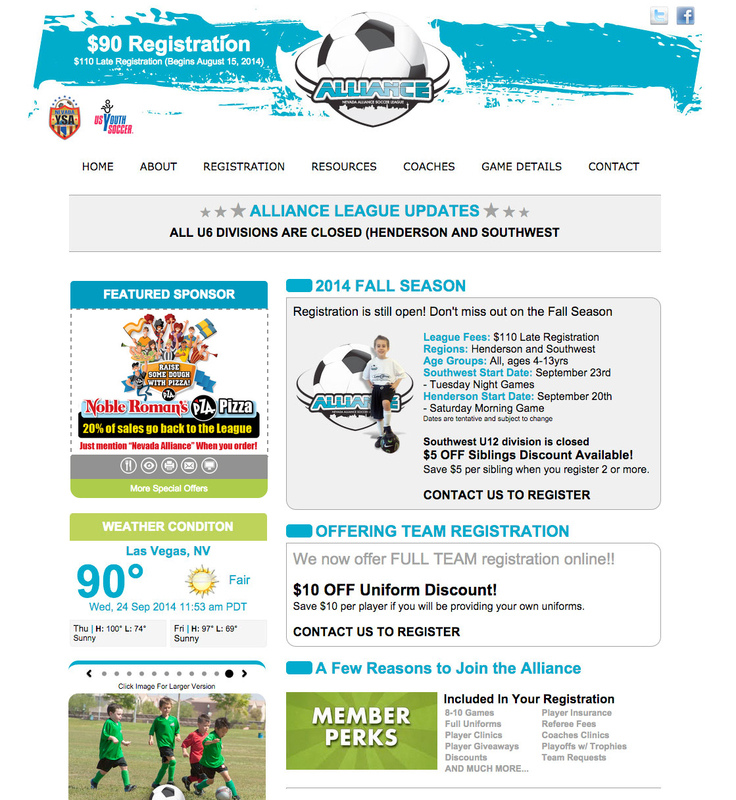 ► Welcome email introducing the organization as our League Sponsor. 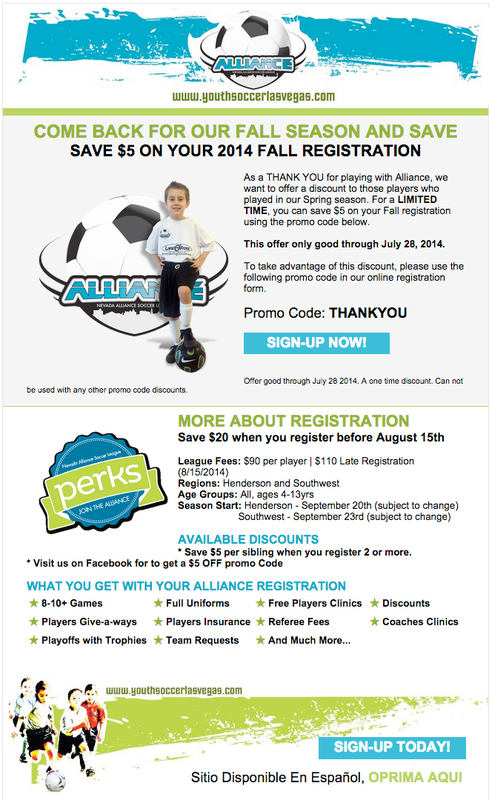 ► Special offers from sponsor inside 8 promotional emails for the league. ► 6 Facebook posts including welcome post. Can be offers or news. ► Sponsor coupon on offers page. ► Featured Sponsor offer or Home page ad (300x250). ► Mobile home page ad (600x150). ► Linkable logo at bottom of homepage. Will show in first slide of three. 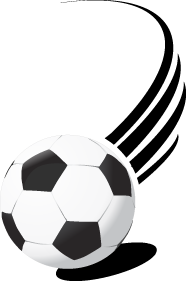 ► Custom corner flags for each field (Henderson and Southwest). ► Custom goalie pinnies (pullover). ► Included on 5,000 6"x9" registration post cards. ► Sponsor "About Page" on website (unique page) linked from "Resources". ► Offer at bottom of every registration confirmation email. ► Allowed hand outs, to be included in each coaches package. Show the community that your company cares...one uniform at a time. All 500+ NASL players receive jersey tops, bottoms and socks each season. The climate in Las Vegas makes it difficult to preserve outdoor soccer equipment for more than a few seasons. With your help, we can continually supply our players with safe and functional equipment each season. 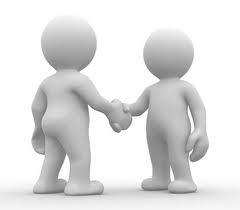 If a monetary donation is outside of your means, feel free to contact us with your idea for a mutually benefiting partnership. Whether it's in-kind trade or a cross-promotional opportunity, we are always interested in creative partnerships that can help improve the league for it's players, coaches and parents. What better way to connect with people than in-person... Set-up a table, booth or just hand out coupons to Alliance families and get your name out there. This is your chance to leave an impression on someone and drive people to your place of business.